On Tuesday, October 30, Morpeth Camera Club welcomed guest speaker Sue Hingley, a member of Whickham Photographic Club, with her presentation entitled Me And My Camera. Sue started the meeting by talking a little about her photography. She explained that her life in photography had started at the age of seven when she was given her first camera, a Kodak Brownie 127 film camera. She spoke enthusiastically about her camera being a tool that enabled her to connect with the people and places and things that she photographed. Sue explained that the full-frame camera and the lenses she currently uses enabled her to crop images and select the part that produced the picture she wanted. She also commented that most of her photographs were in monochrome (black and white), but that she liked to use colour when this enhanced the image. Sue then went on to show a wide variety of images that had all been taken from 2012 onwards, giving members of the camera club snippets of information about the techniques she used in producing them throughout the evening. The presentation started with a wide range of pictures taken in the UK, with Sue giving some background information about them as they were projected. 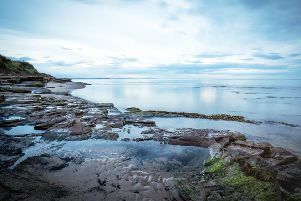 These images included photographs taken at locations and events in the North East. There were pictures of people and banners at Durham Miners’ Gala, the Hopping’s fair in Newcastle, St Mary’s Lighthouse and boats at Paddy’s Hole near Redcar. Some of the many other images included photographs of musicians performing in a pub, architecture at Lincoln Cathedral, Hastings beach and steam engines at Dorset Steam Fair. Many of Sue’s pictures focused on people. Some of those pictured were posing to have the photograph taken, while others were captured spontaneously. These images illustrated how effective photographs can be in communicating the character or emotions of the people while they were in their natural environment or enjoying leisure activities. In the second part of her presentation Sue went on to show members a wide range of interesting images from other parts of the world. She explained that many of the photographs were taken during organised tours. Some of these images showed spectacular locations, including the Grand Canyon in the United States of America and scenery in Vietnam. Others, together with Sue’s comments, gave members of the camera club an insight into train travel in the United States and the environment and living conditions of many people in some other countries, particularly Vietnam and Cuba. Her photographs from Cuba especially showed the neglected state of buildings and the poverty of people in Havana and other parts of the country. At the end of her presentation the club Chairman Mark Harrison thanked Sue for a very interesting show. A selection of 20 of her prints were displayed for members to enjoy over tea and coffee.